2016 is drawing to an end, and Jason is in London. Leaving De De Cup, Geoff and Gary in the studio for the final show for 2016. In this show we cover the latest of the news, look forward towards the trends we expect to see in 2017 …. 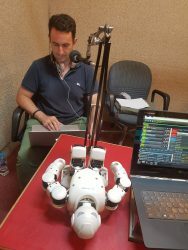 And we introduce the UBTech Alpha 1 robot to the Radio 2RDJ Studio. This is a truly fun but educational device, with lots of features to keep you not just amused, but interested in exactly what this sort of tech can do. As well as the podcast of the show, demonstrating a robot is probably not the best idea for a radio show, so we broke out Geoff’s iPhone and Periscoped the segment so that you can have a better idea of exactly what was going on in the studio.